From our experience, we have found that most 2 Door cars require 7 yards of Windlace and most 4 Door cars require 14 yards of windlace. We recommend that you verify the length that you need before ordering. 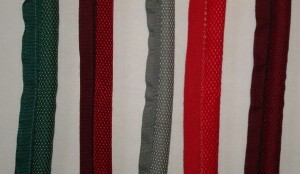 Stock Interiors is proud to offer the highest quality reproduction Pontiac Executive Windlace available. Our Reproduction Windlace is a woven fabric, sewn around a 1/2 inch foam rubber core, with a 3/4 inch flange for tacking. Occasionally it is necessary for the installer to sew strips of stiffener material (such as cardboard) to the flange.